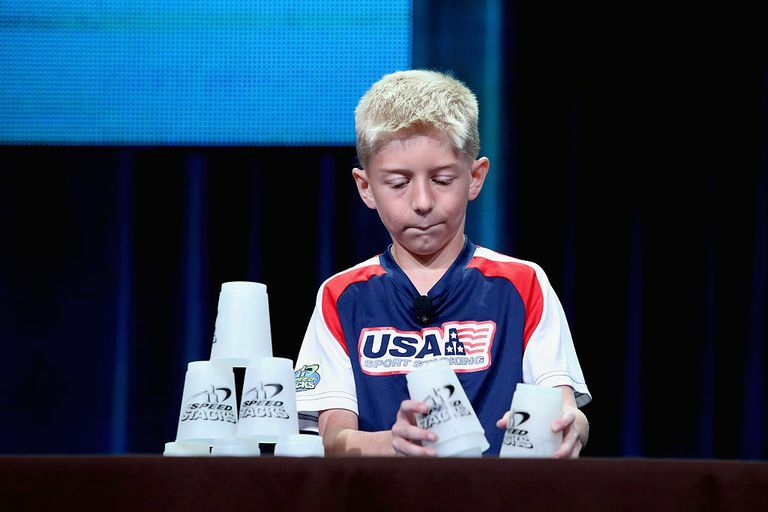 Find out how the unique sport of cup stacking really stacks up. Sport stacking may not seem like much of a sport, but watch a few videos of stackers in action and you will likely be convinced. Also known as cup stacking or speed stacking, this activity takes incredible dexterity and focus to master. Plus, it's safe, inexpensive, and not overly time-consuming, unlike so many other youth sports. The basics: Players stack specially designed cups in specific sequences—up into pyramids of three, six, or 10 cups, then back down into nested columns. Competitive events also include "cycles," in which different stack patterns must be created in order. Recreational and sanctioned sport stacking tournaments take place in the U.S., Canada, and around the world. Physical education teachers may also use sport stacking cups for classroom games that incorporate physical fitness activities. Age kids can start: About 5 (competitive events start at age 6 and under). Skills needed/used: Hand-eye coordination, focus, teamwork. Best for kids who: Want a safe, fun activity that challenges them mentally and physically. Season/when played: Year-round, with the season starting in July. World championships are held in April, but regional tournaments continue in April, May, and June. Sport stacking is also an event at the AAU Junior Olympic Games, held annually in the summer. Team or individual? Both. Players can compete in solo, double, or relay events (relay teams consist of four or five players, depending on the event). In doubles events, each player uses only one hand, so serious teamwork is required. Schools, churches, and other community organizations often organize teams or clubs for stacking. Levels: The World Sport Stacking Association recognizes 12 different age divisions, ranging from 6 and under to seniors (60 and up). Kids' levels are: ages 6 and under, 7 and 8, 9 and 10, 11 and 12, 13 and 14, 15 and 16, 17 and 18, and are broken out into male and female groups in solo events. There are also child/parent doubles teams (grandparents and stepparents can play on these teams too). Appropriate for kids with special needs: Yes. There are "Special Stackers" events for kids with a recognized physical, intellectual, or developmental disability. Fitness factor: Sport stacking doesn't burn a ton of calories, but it does get players moving (they usually stand when playing) and of course, their hands and arms must be very quick! One small research study calculated the energy expenditure of sport stacking at 2.9 METs, a moderate level of activity on par with archery, bowling, and leisurely walking. Equipment: Sport stacking does not use regular plastic cups. Instead, official cups are specially designed for the sport. They have holes in the bottom to help them stack and unstack quickly and easily. At tournaments, cups must be stacked on official, touch-sensitive "stack mats" that act as timers. Different kinds of cups (heavier, larger, smaller) are also available for different activities, but for competition, the standard cups must be used. Costs: A set of cups for practicing is only about $20. A timing mat costs $30. Tournament entry fees are low, usually $25 to $30. Time commitment required: Pretty small. Practices will depend on the club, but may be held for just 30 to 60 minutes a week. (Players can also practice on their own and compete without a club or team membership). Tournaments typically last a day or two. Potential for injury: This non-contact, indoor sport offers a very low risk of injury. If your child likes sport stacking, also try: Table tennis, juggling, jump roping, martial arts.